Joseph Ben-David died twenty-five years ago, in January 1986. An eminent sociologist of science, and a co-founder of this sub-discipline, he was only sixty-five years old. Few social scientists are remembered after they die and can no longer parlay their influence into the goods of this world for colleagues and acquaintances. This was not Ben-David's fate. His work continues to be taught and referred to by scholars spread far and wide (in terms of both countries and disciplines). His students never forgot him, his books were republished, and his essays appeared in new collections. Ben-David's legacy includes ideas and ideals. Its central tenet is the autonomy of science, its right--and duty--to be value-free. Scholarship oriented to any goal other than the accumulation of objective knowledge about empirical reality, for him, was science no longer and did not have its authority. In this light, the life of scholarship was one of moral dedication, with nothing less than the fate of liberal democratic society depending on it. And for science to thrive, the university, its home, had to be the embodiment of the cardinal virtue of this society: the virtue of civility. 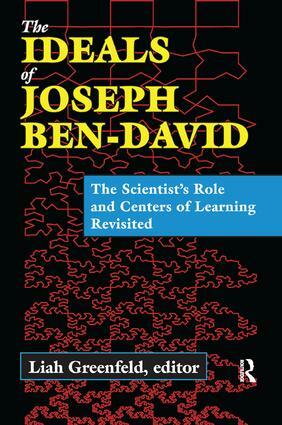 In the spirit of Ben-David, believing that scholarly debate advances common good, and rational discourse wins whichever way arguments in it are settled, this festschrift debates such core issues as the nature of science, its changing definition and position in Western society, the forms of organization optimal for scientific creativity, and the ability of the research university to foster scientific growth, while also performing its educational role.